When it comes to music, the concern over piracy has been a shrinking one for a few years now. As far back as 2009, we've seen illegal download rates precipitously drop. Yet, Swedish-born music streaming service Spotify is still on the case. The P-word was well covered during Spotify's Dec. 11, 2013 announcement of Spotify Shuffle for mobile devices. 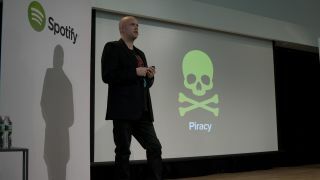 In fact, company CEO Daniel Ek devoted an entire slide to piracy before even getting to the meat and potatoes of the event. "I speak from the heart when I say that I truly believe we're turning the corner on this," Ek said of piracy. "We're leading the way on this one. We take that responsibility very seriously." Spotify has essentially been saying this since 2009, but how? If you ask Valve, creator of online PC games store and community Steam, it will tell you that it simply created a desirable product. The Spotify chief has a similar theory: "We did this by offering a great service, truly free to anyone who downloads Spotify on their computer," Ek touted. "But at the same time, we've had over a 20% conversion rate over to Spotify Premium. And this is really unheard of - some people didn't even think we could get to half of that conversion rate." That's an impressive number, especially considering Spotify's 24 million active users worldwide. That's 4.8 million users paying $9.99 a month, for those keeping score, 70% of which the company claims it pays back to rights holders. This raises an important question: Why in the world are 4.8 million people inspired to pay up for Spotify Premium when they can get that music for free instantly? "We see this clearly in our data, the more music you play, the more you are likely to pay," Ek vaguely stated. Perhaps it's the advertising driving them to pay. Maybe it's the allure of offline access to nearly any song you want without the hassle of seeding and leeching on the torrent file sharing site of the month. For many, if not most, that's likely the case. Now, with Spotify Shuffle, the company looks to apply a similar strategy to mobile. The feature allows playlist access for free on iOS and Android, a first for the service, but in a way that's just limited enough to (Spotify hopes) drive that conversion rate even higher. Shuffle lets free mobile users listen to any artist or playlist they want, but only by shuffling the playlist or discography starting with the song of their choice. However, free users still cannot go offline with these tunes, and they will still get hit an ad after every three or four tracks. "What we've seen in our research and our testing is that, as people listen to those playlists and artists for free on mobile, and they get more invested, the more likely they are to pay over time," Spotify VP of Product Charlie Hellman tells TechRadar. "[This is] because they want to offline those playlists, listen to them uninterrupted and get more control. That's based on the sometimes counterintuitive logic that the more that you give away for free, the more people get invested and the more they want to pay." Yes, but never give the whole store away. While Spotify is just one service, it's moves like these that might turn the tide even further in the war against piracy, if even necessary. Or, rather, the struggle for better digital music solutions. Spotify Shuffle will be included in the company's expansion to 20 more markets in 2015. If you follow Ek's logic: "Along with more free users, there will be more subscribers, meaning more revenue back to the music industry." Yes, but what else is Spotify doing to help put the pirates to rest? Specifically, those that download illegally for access to the highest-quality digital music: FLAC, or lossless, files? (For the audiophiles out there, the 320kbps maximum bitrate that Spotify Premium offers generally doesn't come close to that found on lossless tracks.) Not much at the moment. The idea here is that, the higher bitrate a file has, the better the sound quality. Hellman tells TechRadar that Spotify currently has "nothing to announce" regarding lossless sound file quality. However, Hellman says that he is "confident" that his team of engineers could achieve higher bitrate streams, if the company so desired. For the time being, the diehard pirate still doesn't have much reason to abandon the trade, so to speak. While Ek said that Spotify takes its responsibility to combat piracy seriously, maybe there's just no saving pirates in their hardest of hearts.